Muse has returned. Orchestra, check. Rocking guitar riffs, check. Falsetto of amazing heights, check. Dubstep? Weirdly enough, yes (“Follow Me”), thanks to Nero. Political commentary, oh yeah. 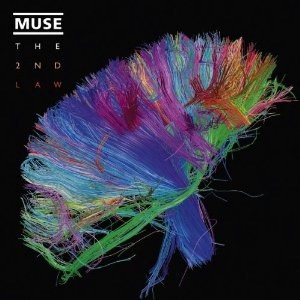 This 6th album is named in honor of the 2nd law of thermodynamics, which defines the concept of thermodynamic entropy. It’s an expression of the tendency that –wait let me reign in our inner nerd — it means everything will dissolve to nothing eventually in a isolated system in a process that is not reversible. Cheery outlook on our future, Muse has. “True emancipation is a fantasy,” croons frontman Matt Bellamy in “Supremacy,” beginning as they mean to go on in the outlook department. “Survival” was the official song of the 2012 Olympics in London; not too shabby, eh? The second single is “Madness,” the love song that will be your next earworm. Bassist Chris Wolstenholme wrote and sang lead vocals on “Save Me’ and “Liquid State,” so that changed it up a bit. Plus, the album art is from the Human Connectome Project, which maps the pathways in the brain in neon colors — our inner nerd seriously geeked out over this. Muse is not reinventing the wheel here, but hey, we like how they play with it, so that’s good enough.